Thick with assumptions and emotions, the question “Is Jesus Good News?” throws a wrench into our world as to destroy an engine (our life) – producing smoke (debates) and loud noise (screaming). Usually Jesus is depicted in more colors than a rainbow or even the Skittles Candy! Most likely Jesus is a softy asking people, “won’t you be my neighbor?,” a mean tyrant dictating a cult on mission to kill everyones joy, or an ATM machine dispensing free cash, wealth and other prosperity (never revealing that inflation took all the value away). What creates these personas? What if Jesus truly does not fit in those depictions? Is it possible to know and believe in truth like Jesus? Religion, especially the Christianized form, places all trust in humanity. Humanity becomes the healer to disease, destruction, division and other ‘d’ words. But what happens when humanity is dying and continues to die? Who’s in control? Are we entrusted to aliens from outer-space after death? Do the lights turn off like a light switch? Become reincarnated? And even if we figure out the death answer, does that become good news for me today – before I die? 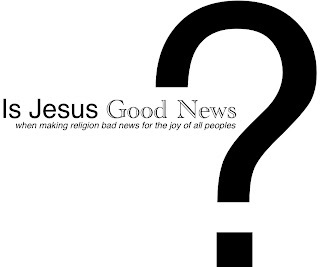 Join Tabernacle Sundays at 7-8pm for a search to answer the question, “Is Jesus good news when making religion bad news for the joy of all peoples?” Begins July 2011 and ends late Summer 2012. Having children to tend to can be difficult as we have two little girls (3 and 5 yr) with a boy on his way. During the service we love having the kids part of the whole night, providing colorful, joyous and many times stinky presence! Bring the kids, they’ll wake up the old people! Playgrounds adjacent to the building and bathrooms provide quick before, during or after play. Come casual or suited up, either way it’s not about you or us, rather someone else. Not a Starbucks but not a cemetery. Greeted with a smile, left with a hug or handshake. Shy and secluded are you? We have the hidden corners of the building for you! Not to bright, slightly lit up. Well, if it’s a trap, then this is the best unhidden trap ever – with a playground, exits all over the place and people claiming they have joyful freedom. Pastor Nate Gunter is one of the pastors jumping on board summer 2010 with a wife, two girls and a boy on the way (October 2011). Studied at The Master’s College and Dallas Theological Seminary. Reads books, teaches at Valley Christian Academy and loves “Daddy Donut Day” with his girls. Susan Logan on Is Jesus Good News?